How do you win an argument with your child? You can’t. Instead, the best and most effective approach to win an argument is to refuse to take part in the argument in the first place. Here’s how to do that. When you engage in arguments with your child, over time he will begin to believe that he is your peer and that he has the power to challenge you. The more powerful he thinks he is, and the more fighting and arguing gets him what he wants, the more he will use fighting and arguing as a way to solve his problems. It’s important to learn how to manage this type of behavior in your kids. And one of the best ways to manage it is to understand that you can’t really “win” an argument with your kid. In fact, you lose once you allow yourself to get dragged into the argument. Remember, the goal here is for your child to learn how to be responsible, to be independent, and to develop effective problem-solving skills. And incessant arguing to get what you want is not an effective way to solve life’s problems. Is It Ever Okay to Argue? Let me be clear: there is a difference between a disagreement and a habitual pattern of arguing with your child. You want to teach your kids appropriate ways to communicate a disagreement. Knowing how to express disagreements in an effective way is an important life skill. Generally, it’s best to talk about things you don’t agree on when both of you are calm. Your child should learn how to state his or her point of view in a respectful way. This means without name-calling or being rude. Listening is also a critical skill here because you need to be able to hear what the other person has to say without negating them or becoming defensive. In the end, you may not change your mind, but at least each side has spoken and been heard. As a parent, I understand how easy it is to get into fights with your child. Power struggles can occur over issues large and small, from getting your child to clean her room to arguing over homework and curfew times. That means that you don’t have to get sucked into an argument every time your child wants to have one. Understand that you can’t really “win” a fight with your child. When an argument escalates, hurtful things are often said, people become reactive, and there is a likelihood of continued miscommunication. And when that happens, nobody wins. When you get into argumentative patterns with your kids, you will simply end up losing ground. Your child will stop listening to your rules because he’ll know that if he argues with you, there’s a chance you’ll give in. After all, one of the main reasons kids continue to fight with their parents is because they know they might be able to wear us down and get us to change our minds. 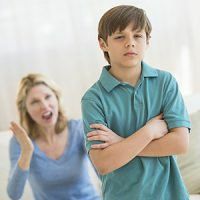 The nine steps outlined below will help you to break the habit of ineffective arguing with your child and will enable you to begin to use more effective techniques to change your child’s unacceptable behaviors. The first step in changing this pattern with your child is for you to know yourself and know your triggers. What pushes your buttons easily? There may even be times of the day when arguments seem to happen more easily. Maybe in your case, it’s the morning rush to get everyone out of the house. Be aware of those times and plan around them. My trigger was coming home from work and seeing my teenage son lounging in the living room eating potato chips—usually leaving a mess. It would push my buttons and we would get into it immediately. I really had to work at not getting angry, giving myself a break, and giving myself some down time after work. I would go up to my room, change, and decompress from my day. When I was calm, I could talk to my son about cleaning up in a reasonable way without blowing up. Know that when you get into patterns of arguing, it makes it difficult to respond thoughtfully to your kids. Arguing becomes habitual. It becomes your go-to response to any issue. And it erodes the relationship. I understand that parental stresses in our lives can really make us feel out of whack. Sometimes we just don’t know other ways of coping, so we lose the ability to effectively communicate. Unfortunately, if we do the same thing over and over, we’re going to keep getting the same results because nothing’s going to change. Once you see that fighting with your child has become a pattern, you need to stop in your tracks and re-evaluate how you’re interacting with him. What happens right before you start arguing? What’s the sequence of events that often leads to the argument? Are there trigger words, trigger requests, or trigger times of day for you? Answering these questions will help you have that insight you need, so the next time you’re there with your child, you’ll be able to stop yourself. Remember, no one ever usually “wins” an argument. Instead, it’s really about what gets avoided through arguing. And what your child generally wants to avoid are consequences, limits and being held accountable for his behavior. In the end, fighting becomes an ineffective habit, one that might lead your child to believe that he can use arguing as his main “go to” to get out of things he doesn’t want to do in life. If you start acknowledging this pattern, you can start to make a change. Plan a strategy for the next time you see a fight emerging. Decide ahead of time that you will not “play” the next time your child tries to pull you into a power struggle. And then leave the room. When you leave, you take all the power with you, and your child will be left yelling at the wall. Your kids are watching you for a living. You can teach your children not to argue by acting differently with them. When you start interacting differently by not arguing, you’re going to teach your kids a different way of communicating. You’re role modeling and you’re offering a different pattern of communication. Remember, our kids watch us for a living—our behavior can teach them more than our words do. Begin with small steps. The first time you walk away from an argument, it can really feel like a great thing as a parent. You made the plan and followed through. Your child may not be happy that you did it, but you probably will. Change may start with a very small step. It could be “the next time my child argues when I say no, this is what I’m going to do.” Plan it out, and then follow through. Don’t get me wrong, this isn’t easy. Your child might not respond the way you want him to right away, but don’t get discouraged. Just stick with it and know that it may take time. As a parent, instead of arguing with your child, think about how you want to come across. Sometimes changing the way you communicate can have a big impact. Change your style, especially with things that cause a chronic argument. I know a family who writes notes or emails to each other when they’re angry, rather than exploding into a fight, and this really works for them. Be creative and think about different ways you can communicate in the moment in order to avoid fights with your child. Figure out different kinds of places to have those conversations with your kids. If you always argue as you’re rushing off to school in the morning, plan to have a different conversation or deal with that topic at a different time. Or if your kid is older, you can ride in the car and have a tough conversation when you might not otherwise do so. If they’re even older, maybe go to a restaurant or sit at a coffee shop and have a conversation there, or try going for a walk. The changes you make now with your children are going to require you to be brave and courageous. This is hard work, but making these changes can break the cycle of arguing. It will really pay off in the long run—it’s so important for your kids to learn better communication skills that they will need as they get older. Sometimes arguments really are hurtful because someone escalates and says something mean or cruel. As a parent, if you can take those words your child hurls at you less personally, it can be immensely helpful. It’s more about the argument (and your child wanting to “win”) and less about how he really feels. If you find you’re arguing with your child all the time, consider getting some outside support. 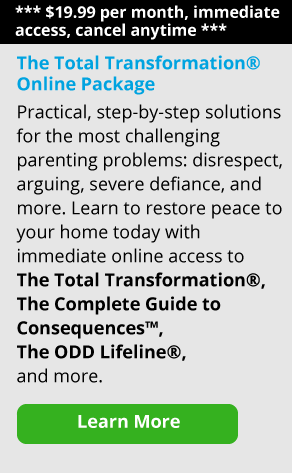 Keep reading Empowering Parents and interact with the online community here, or try a parenting program like The Total Transformation® for tools to deal with your child’s behavior. Use our online parent coaching to get help using those tools. Try to connect with those who you trust. Talk to a friend, a guidance counselor, your spouse, or your partner. It’s good to remember as a parent that everyone makes mistakes and that there is a next time. We don’t learn how to do everything the right way overnight. This is something we have to work on. The good news is that we’re able to learn from our mistakes, and change and grow as parents.